Orientopsaltria beaudouini is a cicada found in Malasia and Thailand. Orientopsaltria alticola (Distant, 1905) is a cicada found on Borneo (Brunei, Indonesia, Malaysia). Its name changed from Cosmopsaltria alticola to Orientopsaltria alticola when it was moved from the Cosmopsaltria Stål, 1866 genus into the Orientopsaltria Kato, 1944 genus. 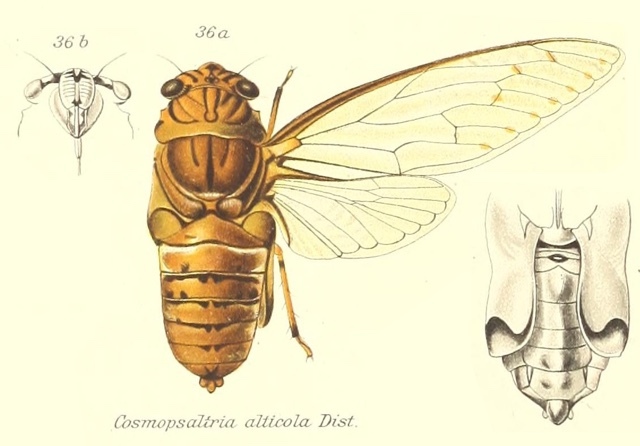 The image says Cosmopsaltria alticola, but the newest name for this cicada is Orientopsaltria alticola.